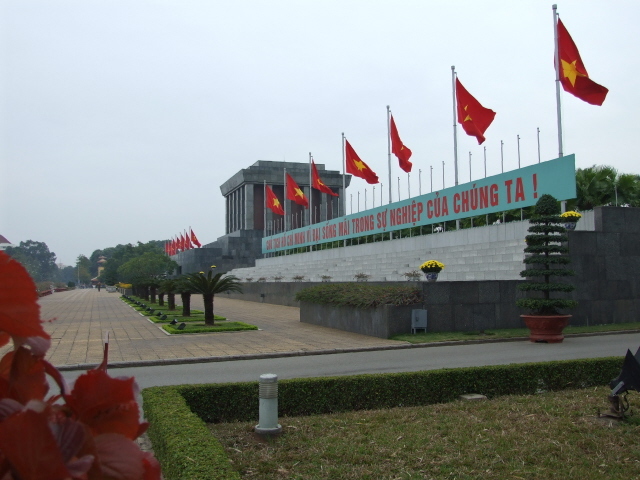 As the name says: the mausoleum of Vietnam's great communist leader Ho Chi Minh in the capital Hanoi. It's one of the "Big 4" of such mausoleums in the world and as such one the country's premier dark tourism sites too. In any case, after his death in 1969 – the Vietnam War was still in full swing – his successors must have thought their former leader's remains were too valuable to be cremated. 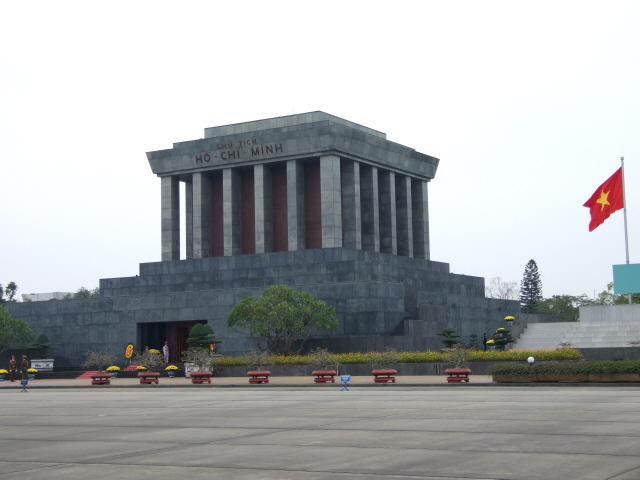 So they kept his body – and in 1975, after the country's official victory in the war, Ho was finally put in this mausoleum. Vietnam received help from Russia in the embalming and preservation techniques required, which the Russians themselves had perfected in the preservation of their revolutionary leader Lenin (whose mausoleum apparently was the inspiration for having one for Ho too). 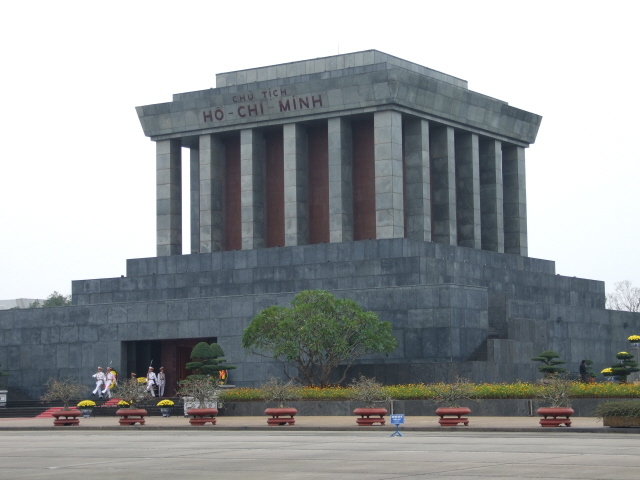 What there is to see: Of all the "Big 4" communist leader mausoleums, Ho Chi Minh's is probably the grandest from the outside (though the Kims' mausoleum in North Korea is much bigger). It's an imposing and elegant structure, made of grey polished granite, blending European and Vietnamese architectural styles (with an emphasis on the former, though). It's basically a cube, with symmetrical square columns on each side, which sits on a giant pedestal. Allegedly the whole structure is supposed to represent a lotus leaf too, though the square shape of the structure doesn't exactly push the association. 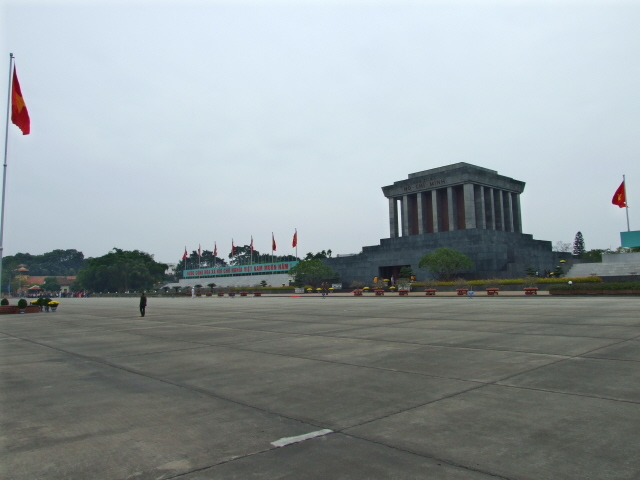 The large square in front of the mausoleum is kept free of tourists by guards, which helps to emphasize its grandeur. To get into the holy of holies, the inside where Ho Chi Minh's embalmed body lies in state, you normally have to queue up. And the lines can be long! There are strict rules, and appropriate attire and behaviour are non-negotiable. Vietnam's great father figure is still genuinely revered by his people, so this is a pilgrimage site that demands the requisite respect. It's a short, but sombre experience. Compared to the other Big 4, it's somehow more respectful, though a lot more fleeting and far less theatrical than the Kims' Mausoleum. If I had to rate them, I'd say Ho's is in second place after the Kims overall, just slightly ahead of Lenin's on the grounds of the elegance of the building and the proceedings and also the greater authenticity of the pilgrimage experience. After the mausoleum you should walk round the building to the north towards the gardens and past the imposing Presidential Palace – a grand French colonial pile painted in a slightly garish orange. Modest Uncle Ho found the palace too grand for him and preferred living in an unassuming traditional stilt house in the gardens. This has been preserved too and these days forms part of the pilgrimage to the mausoleum. So when you've finished there, drop by and join the queues around the stilt house and up the stairs. 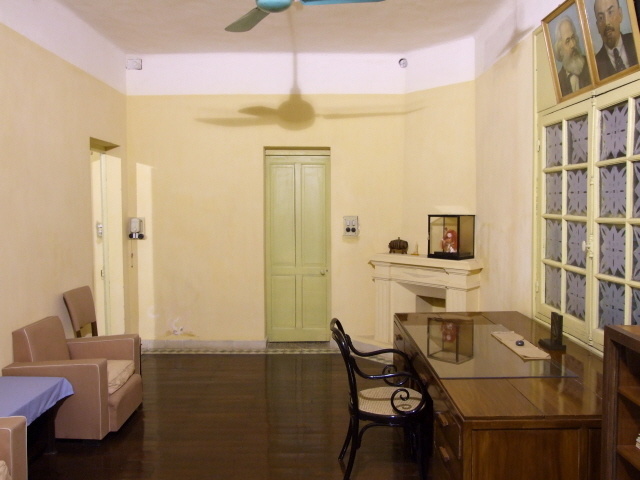 You can see his humble abode (almost) as he left it when he passed away in 1969. 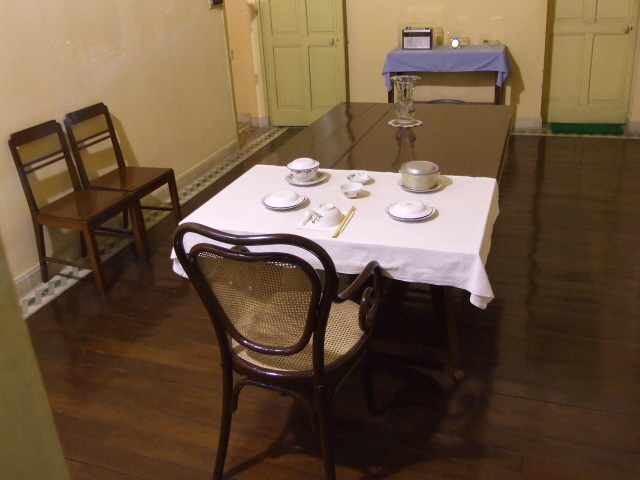 His dinner is still on the table (presumably cold too by now), and you can also peek into his simple bedroom and study – pictures of the great inspiring figures of Karl Marx and Lenin hang on the wall. In fact, the stilt house is only one of the Ho residences here. While the stilt house was being built specially for Ho, he resided in a small stone building (apparently the former electrician's house by the Palace). Don't miss that one before proceeding to the actual stilt house. In a low building a bit further on beyond the stilt house, a surprisingly wide and kitschy range of Ho merchandise is on sale. 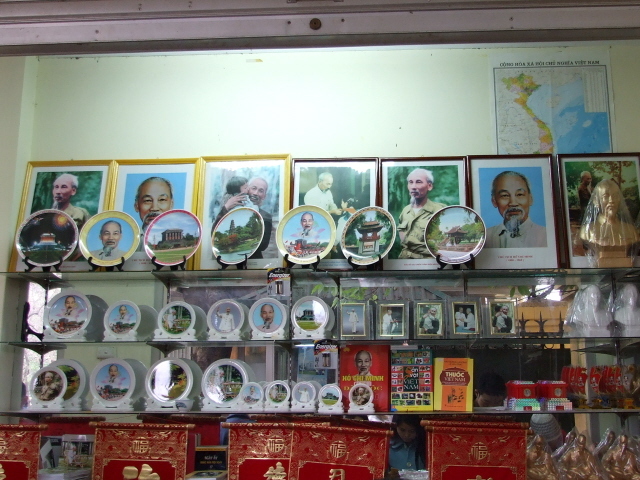 Here you can get your Uncle Ho plate or T-shirt to take home with you, if you so wish. It's a strange contrast to the respectfully subdued atmosphere inside the mausoleum, but somehow it doesn't feel as exploitative as it looks or sounds. 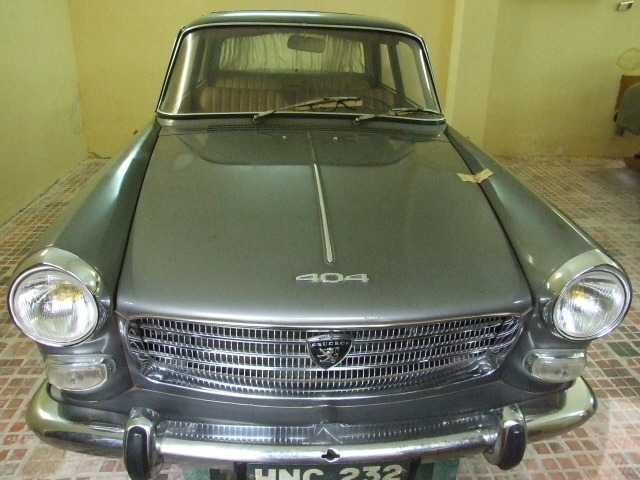 Location: to the west of the centre of Hanoi, on Ba Dinh Square, about a mile (1.5 km) west of the Old Quarter and close to the botanical gardens and Ho Tay Lake. Access and costs: restricted, but free (Mausoleum). Details: The mausoleum is open only in the mornings, Tuesday to Thursday and Saturday/Sunday, from 7:30 to 10:30. 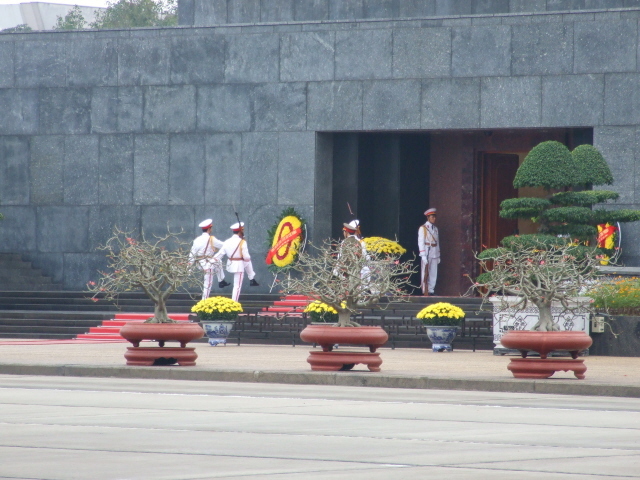 At certain times, usually October and November, the mausoleum remains closed altogether (because Ho Chi Minh's body is sent to Moscow for re-embalming – i.e. the Lenin experts are still at work on Ho too, to this day). Admission is free – but strict rules must be observed: decent attire (no shorts or flip-flops, though ties are not required, so it's a bit more relaxed than at Kim Il Sung's Mausoleum). No photography is allowed, obviously enough. So either leave your camera behind when going here or hand it to a guide, if you have one, while you're inside. Appropriate behaviour is required too, i.e. in particular respectful silence – but that comes naturally, given the solemnity of the atmosphere of the whole place. The Ho residences (including the stilt house) are in the Presidential Palace's garden next door, which is open daily 7:30 to 11 a.m. and 1:30 to 4 p.m. (on the same days as the mausoleum), and costs a minuscule nominal admission fee (ca. 3000 Dong). Time required: only a couple of minutes inside, but expect long queues moving slowly. Also allow some time for admiring the building from various angles from the outside. 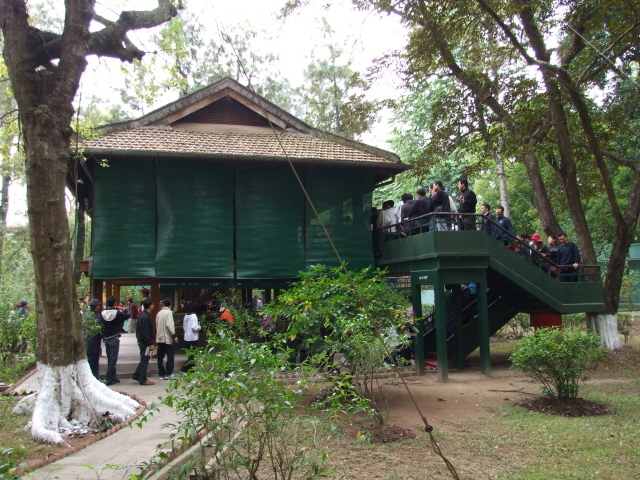 Combinations with other dark destinations: the obvious combination is Ho Chi Minh's former stilt house (see above) and just round the corner to the south-west of the mausoleum is the Ho Chi Minh Museum. Beyond that see under Hanoi/Vietnam. 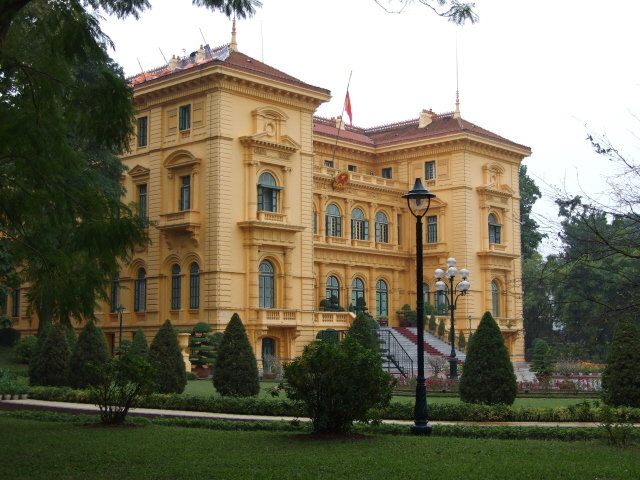 Combinations with non-dark destinations: see Hanoi.